I’m a fan of greenhouse heaters. They’re wonderful tools for extending the season for a couple months, particularly in early spring. I grow in a small urban area, so it’s important that I get the absolute most I can from the limited space I have. If you have a greenhouse, whether small or large, the likelihood is that you’ll benefit from a heater. In this guide I look at the different options on offer and have a look at some of the most popular products on the market. Let’s dig in. Click here to jump to our selection of some of the best greenhous heaters from around the web. Simply put, a greenhouse heater is either an electric or fuel-powered heater used to raise the temperature of a greenhouse. 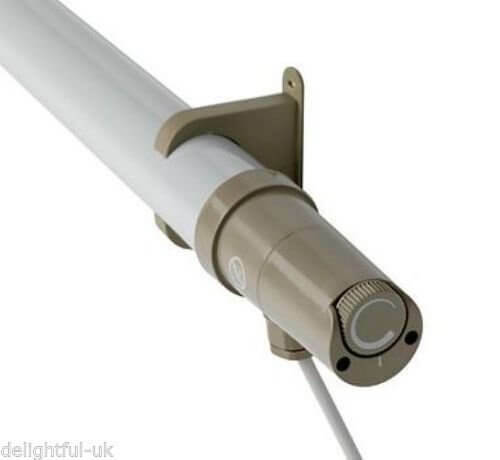 Generally speaking I’ve come across two types – stand alone heaters designed to heat a whole greenhouse (as a heater would heat a whole room) and what are in effect “hot lights”. These are usually tubular and meant to be placed directly above the plants that need extra heat. They have quite a low sphere of heat but can be useful for heating mini greenhouses. Greenhouse heaters are generally used for one of two reasons. Many use them to get an early start in spring, when light levels are increasing but temperatures can still dip into freezing and kill off tender seedlings. They also provide the ability to heat a greenhouse over winter. If you’re growing salad leaves, for example, that can cope with low levels of light but would become dormant with low temperatures, then a heater can extend your growing season into the colder months. You may also want to provide heat for overwintering perennials, like rosemary, that dislike the cold. This Biogreen electric heater has numerous power settings. The thing to bear in mind is that you’ll only be able to add a few extra degrees. The cost of running a heater all night beyond this level wouldn’t be justifiable. 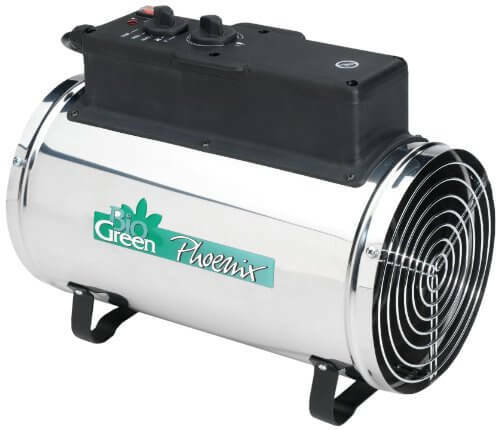 A 1200-1500 watt heater will be more than adequate for a small greenhouse (up to two meters in width/length and head height or thereabouts). Once you’ve decided to buy a greenhouse heater, you have a choice between electric and paraffin. Environmentally speaking, electric heaters leave a smaller carbon footprint. The cost of running isn’t always clear-cut and can depend on the wattage of the heater and the size of the greenhouse. Whilst paraffin or gas heaters do need topping up whenever you think it’s going to be cold, they do run for a long time (often over 100 hours) and they’re easy to fix. A lot of gardeners prefer paraffin heaters. To work out the cost of the electricity you need to know the wattage of the heater and the cost per KWh of your electricity provider of cost. So to work out the cost of running a 1500 watt heater for 12 hours, you would simply divide 1500 by 1000 (this will give you the kilowatts it uses per hour) and multiply that number by the number of hours you intend to use it per day (in this case 12). Multiply that figure by the cost-per-KWh and you have your daily running cost. It’s not usually a huge amount. Thermostat – This is a big one! In order to make sure that the heater is turned off when it gets hot during the day, you’ll want a thermostat. Paraffin heaters are obviously purely manually operated, but if you’re going electric, esure this feature is included. Fan – Whilst it’s not absolutely necessary, a heater with a fan will provide a degree of air circulation, thus reducing the chance of pests and disease. 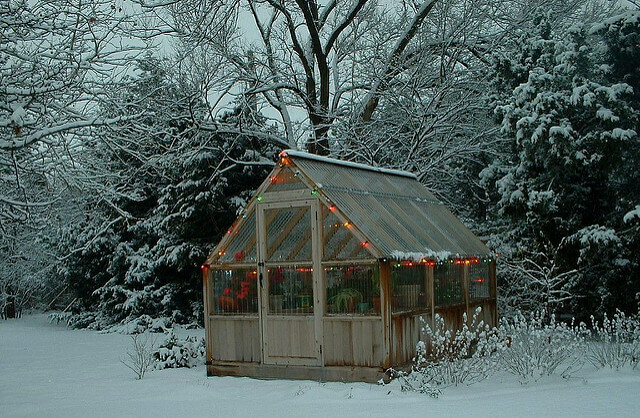 It’s difficult to vent a greenhouse in winter – because doing so will lower the temperature, it’s counterproductive – so keep this in mind. How much have you budgeted for the cost of heating? What power sources do you have available? If it’s going to be a nightmare getting electricity into your greenhouse then you’re better off sticking with gas. If you’re looking for a solid performer then this 2KW electric heater with a ventilation fan is ideal. It’s reasonably priced and performs well. It’s thermostatically controlled so you can set it to come on and off at whatever temperature you want . The fan also means that heat distribution will be good and that plants will be well-aerated. It’s good for small to medium-sized greenhouses, particularly if you want to keep the temperature just above freezing for overwintered plants. 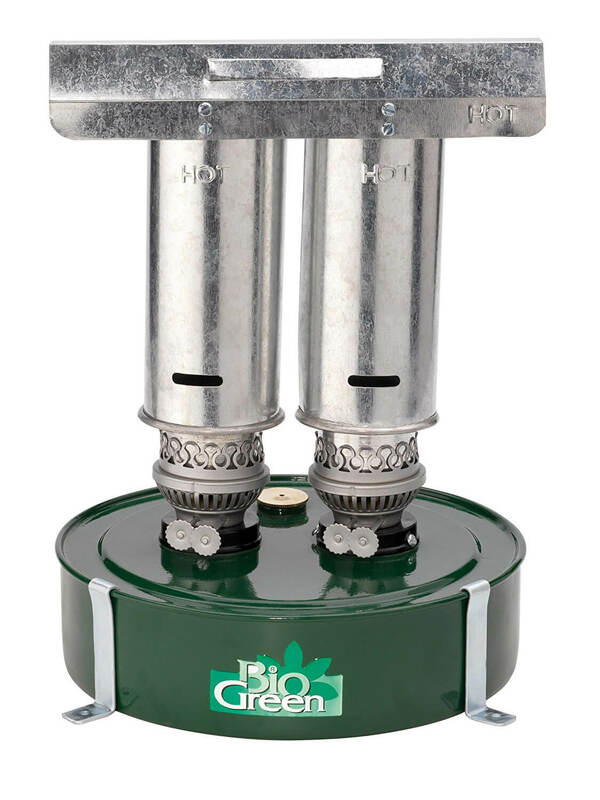 This paraffin heater from BioGreen is a quality product that’s very reasonably priced. It’s made in a traditional design, with wicks to draw the fuel up, chimneys, and gauges to control the strength of the flame. Replacement parts are easy to get hold of ,so should it ever need fixing it will be far less trouble than an electric heater. It’s very economical and, on the low setting, will run for a long time (weeks rather than days), depending on how many hours per day you use it. Biogreen make a range of heaters – everything from fan to hanging models – so they know what they’re doing. I think this a particularly good choice for occasional use. You can quickly fill it up and get it going without the hassle of plugs and wires. 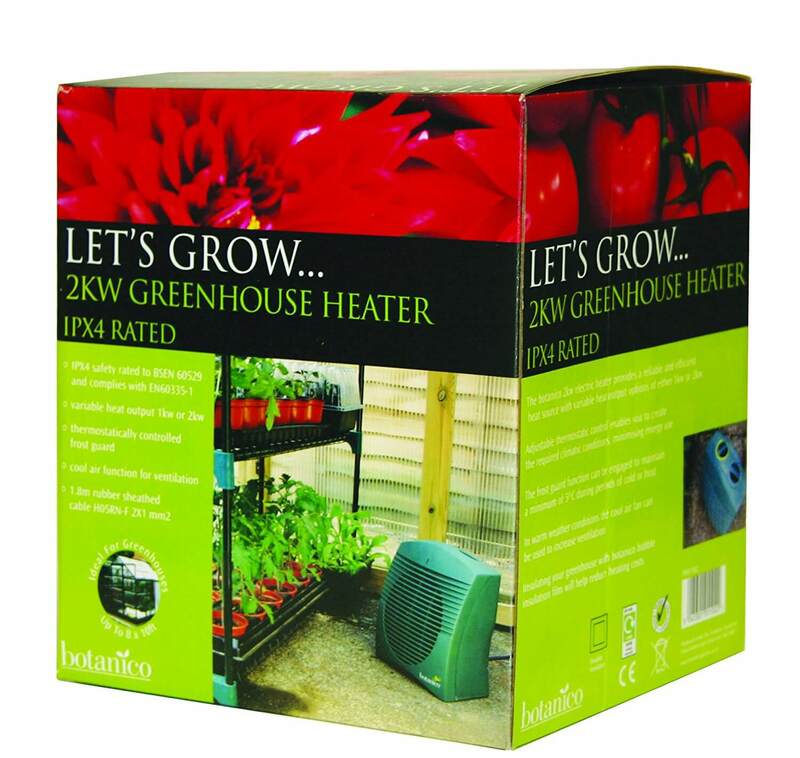 This tubular heater from Sunhouse is for very small greenhouses. The effect in a large greenhouse will be negligible so don’t bother. For mini-greenhouses, however, when it’s placed directly above plants it will provide enough heat to keep the frost away. It’s thermostatically controlled, so you can set it to the ideal temperature. The cable is 1.5 meters long, so if you’re running an extension out it will fit well attached to the roof in a small or mini-greenhouse. Remember: small spaces! For overwintering some of your potted plants through winter, it’s a cost-effective solution. If you want to make an investment in something that’s going to last then go for this one. It is at the higher end of the price spectrum, but that’s to be expected. Because of it’s quality, it doesn’t suffer from a lot of the problems that are common in less expensive heaters. The thermostat, for example, is very quick to respond to drops in temperature, so there isn’t a lag in as the heater catches up and the accurate reading means that you won’t waste money with overheating. It has three KW settings (1, 1.8 and 2.8) and can be hung from the ceiling (it comes with chains) or secured to the floor. An air circulating fan (which can be turned on or off) ensures equal distribution of heat and good ventilation. What are your thoughts? Have you tried any of the heaters on this list? Leave a comment below and let me know!